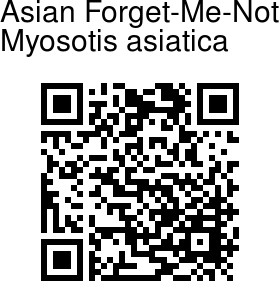 Asian Forget-Me-Not is a perennial with a single, erect or cespitose stem 20-45 cm tall, sparsely spreading bristly, sometimes cottony. Basal and lower stem leaves are stalked, narrowly inverted-lanceshaped to linear-lanceshaped, to 8 cm x 5-12 mm, bristly, hairs discoid at base, base narrowed, decurrent into a wing, margin entire, tip rounded to	pointed; upper stem leaves stalkless, smaller. Inflorescences are to 15 cm after anthesis, ebracteate. Flower-stalk is erect in fruit, 4-6 mm, densely short bristly. Calyx is 1.5-2.5 mm, to 4-5 mm in fruit, parted nearly to base; sepals lanceshaped, with densely spreading or hooked hairs, tip tapering. Flowers are blue; tube about 2.5 mm; throat appendages about 0.5 mm; limb 6-8 mm wide; lobes 5, round, about 3.5 mm. Anthers elliptic, tip with an round appendage. Nutlets dark brown, ovoid, about 2 × 1 mm, smooth, shiny, base without appendages, margin narrow. 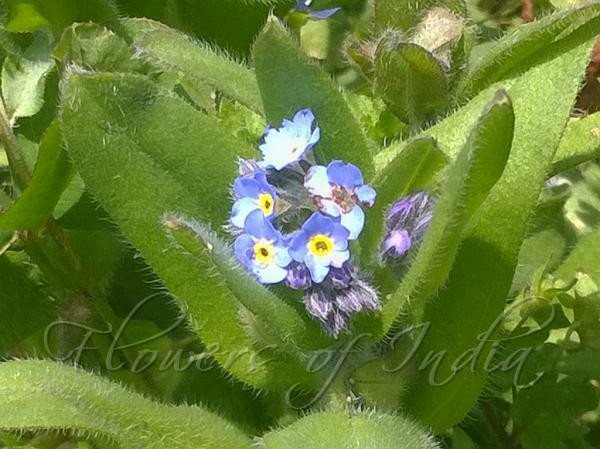 Asian Forget-Me-Not is found in Europe, West Asia and Western Himalayas, at an elevation of 2800-2900 m.
Identification credit: Akshay Kumar Photographed in Barot, Tikkagahar, Himachal Pradesh.